Okay, it’s not like I have more than one office. Heck, I don’t even have an office outside my home. But one of the great advantages of today’s technology is the mobility it offers the working world. I take full advantage of this and regularly hang my shingle in area coffee shops. It’s amazing how many people do the same. 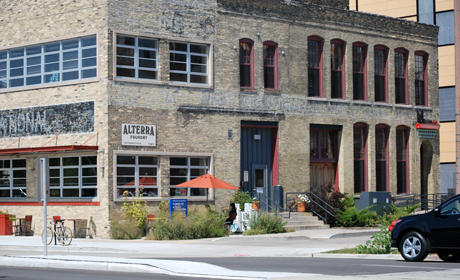 Alterra Foundry is a cool coffee venue on 170 South 1st St., Milwaukee. 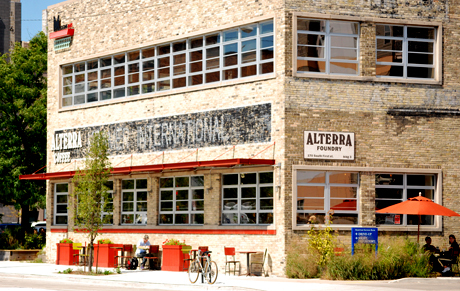 Fresh roasted Alterra coffee, as we all know, is one of the many fine Wisconsin products displaced Milwaukeeans crave. Their food menu is good as well—much more than just muffins and scones. And, really nice, the internet is free (not the case for many Milwaukee coffee shops). The one downside is a very small parking lot, if there’s even one at all. But I go down E. Pittsburg and park on a side street. So far, I’ve always found a spot. 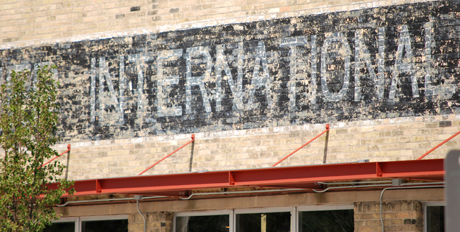 I love when old, out-of-use industrial buildings are put back in use as something different. 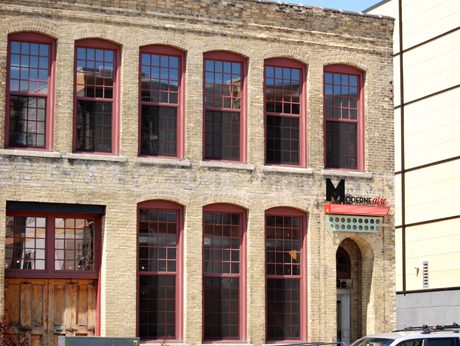 This building is the former Kramer International Foundry and its new decor honors the blue collar heritage that built Milwaukee. How’s this for a study of architectural contrasts? 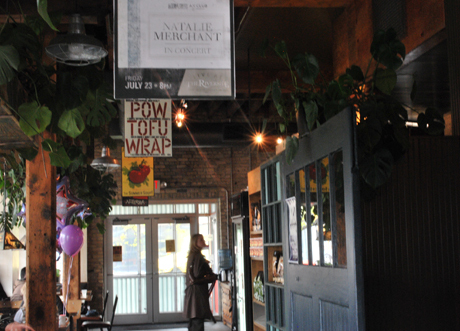 The coffee shop side is very industrial with its modern, rectangular, metal windows. 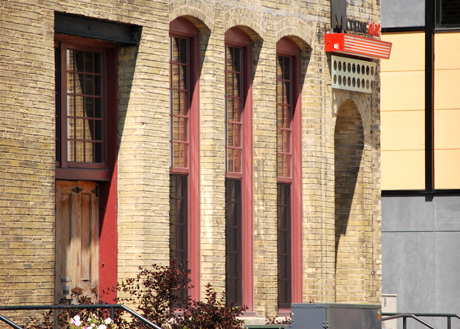 The other side, a furniture gallery, is traditional with wood, double-hung windows and rounded archways. Interestingly, the gallery on the traditional side is called Moderne-aire. As a local Yahoo review says, it has “decorative arts, furniture and furnishings in styles including Mission, Moderne and Art Deco.” I’ve got to check it out next time I’m there. This side of the building is my favorite. I love the tall, repeating rows of windows and the wooden dock doors are so beautiful.